I've been using the Eminence Pink Grapefruit Clarifying Masque for about a week and a half now. I got it from Apothica because I've used Eminence products before in a Makeup and Muses post with good results. I picked the organic grapefruit masque because the product description used the phrase "under siege by blemishes" and that's exactly how I was feeling a few weeks ago. I really couldn't catch a break...only a breakout. 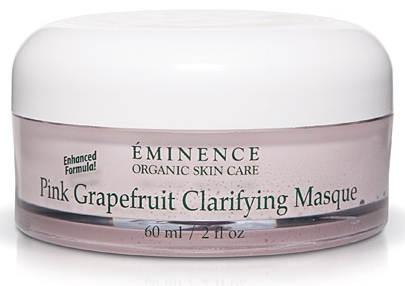 The Eminence Pink Grapefruit Clarifying Masque is said to detoxify your skin with the grapefruit and biocomplex ingredients (whatever that means). Well it means the ingredients should brighten the blemishes and protect against free radicals through vitamins A, C and E. Kaolin Clay is what's used to exfoliate the skin, and it's great for dry, sensitive me. Although I do like this Eminence product a lot, I haven't really seen those biocomplex ingredients kick in just yet. I do feel like it exfoliates and leaves my skin feeling smooth, so I will keep using it for a few more weeks to hopefully see better results. Have you used Eminence products before, or any clay masques? I will check with you in few weeks. I haven't used their products before though. i've never used their stuff...but it sounds interesting. hopefully it starts working better for you! i love that pic of you with the mask on...so cute! Hmmm I'll be curious to hear if it ends up working really well further down the line. One of my friends introduced me to this skin care line last year. It's really good and I love their natural products. I'm not surprised that this works really good. Excellent review Cheryl. It definitely sounds interesting! Most products you have to give a good 4 weeks before results... I bet your skin will be feeling amazing by then! Keep us posted! I'm always looking for new great products to try out, from tour list of Pro's, this one does sound quite good, i like the dual option. Pity about the lack of improvement...maybe your skin is already in tip top condition! I bet this smells great! Thanks for the review dear! I used to wear masks like this when I was in middle school, just for fun. But then it got to be too much of a headache and I quit. I probably should start doing some kind of face regimen now that I'm inching towards 30. Lol. Too bad the mask didn't work out the way you hoped. I'd give it a few more tries at least. Who knows maybe it'll kick in after a few weeks. Aww! You are so cute with that mask on! :P I am willing to try it, I love pink grapefruit scented things. Which lens do you use as your primary? And I used to use Eminence - I used to work at a spa that used it. Now I really love Obagi. Beauty products are so fun! Great review Cheryl, will have to check this one out. Thanks for the review! I've been looking for something like a face mask or something to really help the blemishes on my face. I'd like to try this product but everyone's skin reacts differently to different products. I was thinking of going with something like Neutrogena but I don't want anything to dry my face out. Looks like I something to add to my wish list.